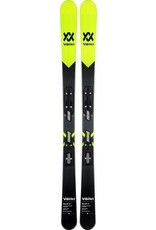 The Völkl Revolt Jr Vmotion is designed for young skiers looking for an easy-to-operate ski for a freestyle program. Its 74mm under the foot provides a good compromise between edging accuracy and forgiveness in softer snow. Its radius of 13 meters allows it to be comfortable on all types of curves, while its full rocker profile gives the ski a modern behavior(slide and pivot).